Trainer Stephane Wattel is to prepare City Light for another crack at the Diamond Jubilee Stakes following his fine effort last summer. Wattel is keen to take City Light back for the Group One over six furlongs after he was only beaten a short head by Merchant Navy, and his campaign for the first half of the campaign will be geared towards that objective. “I guess the plan is (Ascot), it was such a wonderful day at Ascot. We’ll try to come back if we manage to have the horse in full condition for this time,” the Deauville handler told Sky Sports Racing. Royal Ascot’s most prestigious sprint became the Diamond Jubilee Stakes in 2012 in recognition of Her Majesty Queen Elizabeth II’s ascension to throne in 1952. It was elevated to Group One status to celebrate the Queen’s Golden Jubilee in 2002 and run as the Golden Jubilee Stakes from 2002 - 2011. 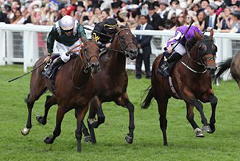 Prior to 2002, the contest was known as the Cork & Orrery Stakes. The inaugural running of this six-furlong contest took place in 1868. The race was named the Cork & Orrery Stakes after Lord Cork, a Master of the Buckhounds, from 1926 to 2001. It became part of the Global Sprint Challenge international series of sprints in 2005 and was restricted to four-year-olds and upwards with the first running of the Commonwealth Cup in 2015. The Diamond Jubilee Stakes is part of the QIPCO British Champions Series.